American walnut real wood veneer on plywood Baltic birch. White laminate on plywood Baltic birch. The cradle is designed for the bedroom at night, and for the living room during the day. 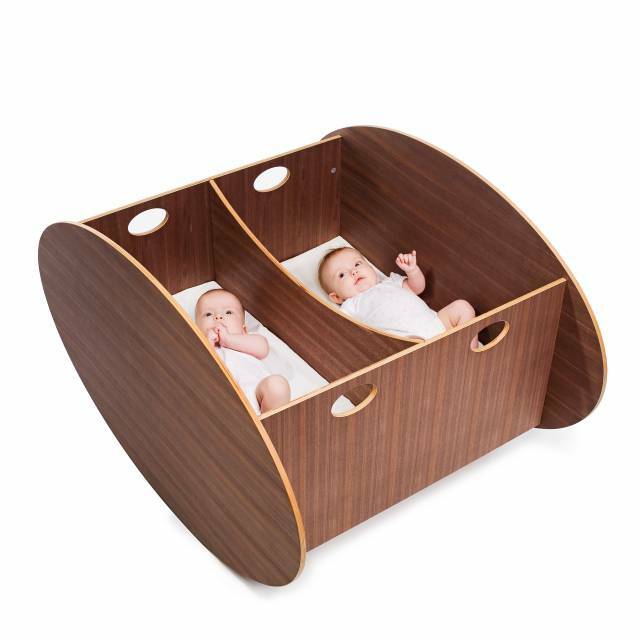 Like with all cradles, it is used from newborn stage until the baby is crawling or when the baby is able to pull up. Normally from 0 to 6 months. The cradle is designed in a safe manner and will only have the ability to turn when one end is lifted up. An adult can stand in the cradle without tipping the cradle over. The cradle is 43 inches long, and 25 inches tall. The matress measurments are 17 inches x 31 inches. The cradle rocks in a gentle and stabile manner, with very little effort. Here the jury sees a refreshing idea that has been embodied in good design. The so-ro is innovative in its class, both in terms of design and functionality. This represents completely new thinking in a market that is open to new solutions. There are many traditional cradles on the market and it is a positive thing that someone has made the effort to present something new. A cradle is in itself a nostalgic item, but here this traditional piece of furniture has been interpreted so that it fits beautifully into a modern home. The double functionality is practical and the slightly asymmetrical position in the form of a slight tilting of the mattress is good for the child’s reclined position. The value of the so-ro is increased by virtue of it being easy to assemble, disassemble and store.